An interesting mixed use development has recently been completed in McEvoy Street Alexandria. An existing former engineering workshop and office building has been adapted for commercial use, which in combination with a new four storey apartment building forms the edges of an intimate new public courtyard space containing cafes and restaurants. 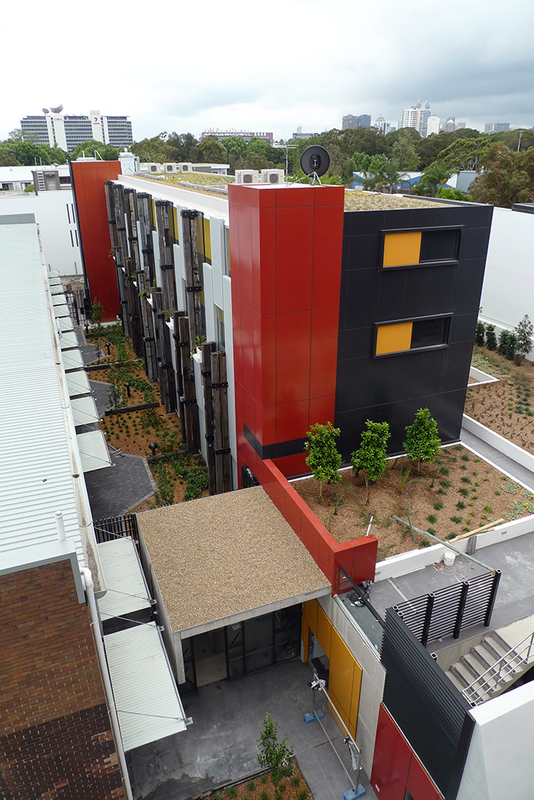 The new apartment building was designed by Turner Studio Architects and the construction was managed by Statewide Project Management Pty Ltd. The scope of the landscape works included the street level public space, an intensive roof garden forming a level two communal space plus an extensive roof garden to the top level. The public courtyard space also features the adaptive reuse of structural timbers as seat and building facade members plus porous unit paving to minimise runoff and assist the development of deciduous feature trees. The landscape works were constructed by Bates Landscape and project was completed at the end of 2014.